Now that's better than any dumb ol' swan. Artists Antti Pedrozo and Michel de Kok show off the freakin' scale of this beastie, and look at that detail (yes you can click to enlarge)! Like it was posted on Neatorama, with an Autobot shield, robotic joints and big freakin' cannon (hereby referred to as B.F.C) and I tell you if this was my creation there would be no way I'd be letting it melt. 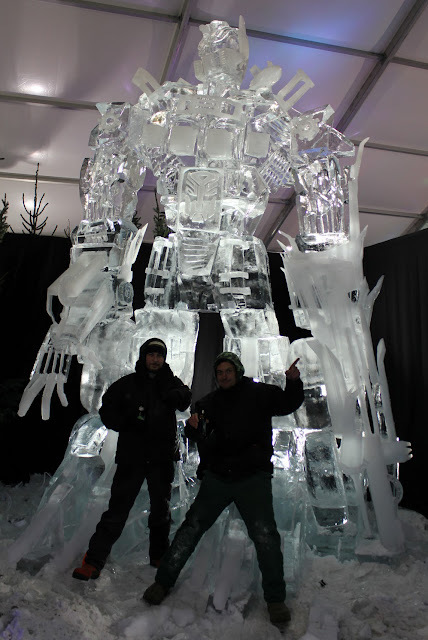 This is way cool, who doesn't like Optimus Prime!? The only thing I hate about ice sculptures is that they're going to eventually melt. what a bleedn shame! Oh! That is so spectacular! But he needs a buddy! Where's ROM? Thanks guys - it is pretty cool huh? And your right Dave - who doesn't like Optimus Prime? oh i remember seeing that before but i didn't know that was yours. very cool nice job on the details. did you use coloring pencils? looking forward to seeing the ROM rendering. Love the Optimus picture by the way. Thanks for the TF love Dan. Thanks Craig and Dave - yeah I use wax colouring pencils for sketching, they allow me to do some wicked stuff. ROM is inked, but having a bit of trouble with the bad dude... shouldn't be long now though! No worries about the TF content Craig, I love G1 and actually have alot of TF things in mind that we got from the UK you might not have seen in North America. My need for Soundwave was how I found out about Santa. I craved everything Soundwave but could never afford the bucks for the toy, and who could Santa. So I wrote for years to Santa asking for that one toy - nothing more. It never came. I said I understood he was busy and reasked and still nothing. Now I learned it was because I've always been a control nut over people reading my mail and even at that age I was militant the letter not slip from my hands until it was in the post box, so Santa's true helper never even got to read my wish. I didn't get my soundwave until the early '90's when I found him for sale on a bbs. In box. It's pretty sweet. I bought Rumble, Ravage, Frenzy, and Laserbeak for Alan and Keith one Christmas not realizing the company was discontinuing G1 before releasing G2. Never saw them on the shelf again. I kick myself to this day.